I decided to write an article about the bells of Holy Trinity as we have two dedicated bell ringers who are working “behind the scenes” or maybe “above the scenes” would be more accurate. Pat Nickerson and Ron Cox are up in the bell tower each Sunday faithfully playing hymns, and my primary aim in this article is to acknowledge the time and effort they put into playing the bells for our parish and the neighborhood. Some people in the congregation may remember that my mother-in-law, Joan Jenkins, was trained by Pat and used to play them also. Because of her involvement, I have had the privilege of going up into the tower and watching the bells being played. For those who have not had that experience, I can tell you that it requires a of physical stamina, being fearless about climbing up and down the winding stairs to the tower, and a humble attitude because the wooden levers make a lot of noise and the bell player does not get to enjoy hearing much of the actual music the bells are producing. The bell player is invisible to those below and his or her efforts are not often acknowledged by the listeners. Also the bell player knows that any mistakes he or she makes will be heard throughout the whole neighborhood. I have asked Pat and Ron to share information and their experiences with me, so really the rest of this article is written by them and I am just the editor. Pat told me that she first played in about 1980 and played regularly from 1982 on. Holy Trinity’s bells can only be played in certain keys and Pat set about transposing many hymns to the keys playable on our bells and she also worked on matching the hymns played to the liturgical calendar. She also tries to play the Westminster chimes on the quarter hours and change ringing at the end of her session. She has been quite pleased to have Ron playing also. Ron notes that the bells have been ringing at Holy Trinity for 107 years and are a sign of not only our parish’s presence in the town of Yarmouth, but evidence of God’s presence. They remind us that it is time for worship and perhaps other people in the neighborhood take time to think about spiritual matters when they hear the hymns, even if they are not attending church. Ron also includes information about the bells themselves. They are played from a room in the lower part of the tower, but are located higher in the tower. The bell player pushes levers which are connected to the bells by chains and rods. 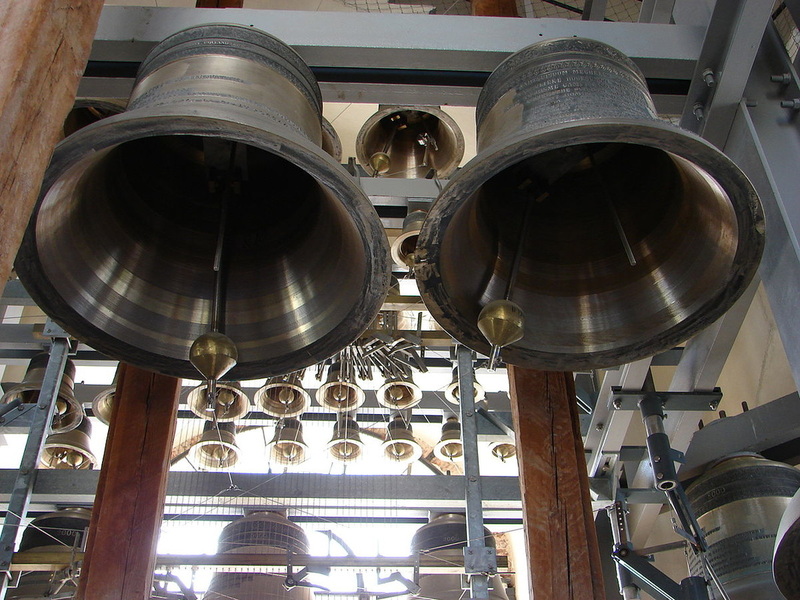 There are 11 bells in our carillon and they weigh about 11,000 pounds in total. Both Pat and Ron are interested in attracting other people to start playing the bells. They assure me that they can get a new learner started even if he/she does not have any previous background in music. Feel free to contact either Pat or Ron if you are interested or know of someone who may be interested. The annual summer bell concert is approaching on July 21st at 5pm, so please mention this to anyone you know who might like to attend. I would like to end this by thanking Pat and Ron for their faithful dedication of ringing out music from the Holy Trinity bell tower each week.